A nine-month long Chinese language course for foreign journalists started at the Beijing International Chinese College (BICC) in the capital of China on Monday. A total of 50 journalists, 16 from different countries of Asia and the Pacific and 34 from Africa, attended the opening class of the course in the afternoon. 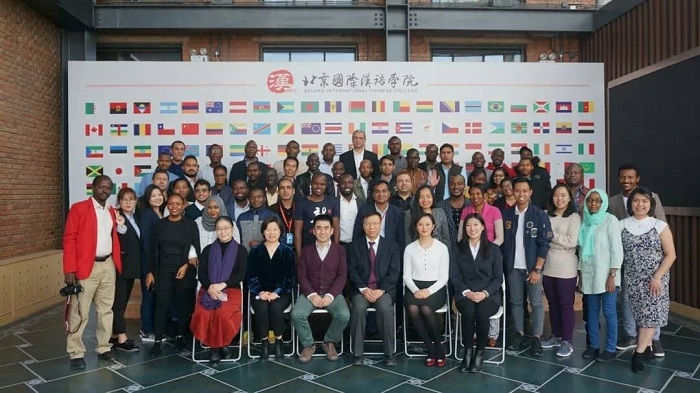 The journalists are in China to participate in the 10-month long training in journalism named the China International Press Communication Center Programme (CIPCC) 2019. China Public Diplomacy Association (CPDA) has initiated the programme to promote practical cooperation between media in China and other developing countries. The programme is designed to help its participants to gain a comprehensive and in-depth understanding of China. Director of the China Asia Pacific Press Center CAPPC Yu Lei, Vice President of the BICC Gui Fan, and its Counsellor Liu Yu'an attended the opening ceremony. Speaking at the ceremony, the vice president said 'Here you will begin to learn Chinese, Chinese characters and more about Chinese culture.' She hoped that all participants will cooperate with the college team and follow the handbook to prepare for the study and activities. The participants will also be taught press courses at Renmin University of China (RUC) besides taking part in folk activities and experience Chinese culture through opera, acrobatics, folk music and traditional Chinese medicine and cooking. The participants will also be offered internship opportunity to an established and mainstream media outlet of China during their stay in the country. It may note that journalists from Asia and the Pacific are taking part in the programme under the banner of China Asia Pacific Press Center (CAPPC), while African journalists are part of China Africa Press Center (CAPC). Under the CAPPC, the diplomatic correspondent of the Daily Sun from Bangladesh is taking part in the nearly-year-long programme.